Lazada Philippines’ big Chinese New Year sale starts today! You can enjoy up to 85% off on select items. Lazada.com.ph‘s big Chinese New Year sale starts today. The sale event runs from February 13 to 16, 2018, with discounts of up to 85% off on select items. Customers who purchases an item within the period get to enjoy free delivery for all Metro Manila orders. Aside from the great discounts, PayMaya and RCBC customers get to enjoy additional benefits. PayMaya users get 15% off (maximum discount of Php 200) whenever they use the code PAYMAYAFEB for a minimum purchase of Php1,000 until February 25. While those who use their RCBC savings MyDebit Mastercard gets a Php 200 discount during the Chinese New Year Sale for a minimum purchase of Php1,500. Aside from the sale event, Lazada seems to have revamped both its website and mobile app as well. The new layout looks a lot cleaner and more modern. Customers now get to see products, brands, categories, and bundles personalized according to their preferences and interests. Also, browsing has been updated to include continuous scrolling of top deals and items. 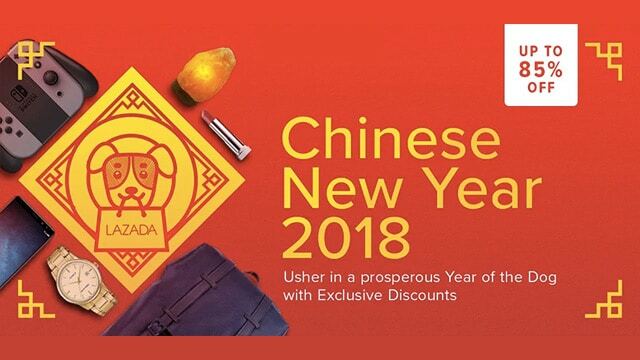 For more information about Lazada’s Chinese New Year sale, you may visit www.lazada.com.ph or you can download the free Lazada mobile app available on Google Play and the App Store.